The community of six Sisters at St. Bride’s Convent were able to offer a religious and literary education to young women second to none. English, French, Latin and Italian languages. Writing, Arithmetic, Book Keeping, Geometry, Algebra, Geography and use of the Globes, Geology, Botany, Physics, Astronomy, History, Shorthand, Music, Instrumental and Theoretical Singing, Drawing, Painting (Oils & Water Color). Wax Modelling, Plain and Ornamental Needlework and Calisthenics. Lessons in Practical Cooking were given to Advanced Classes. St. Patrick’s school, manually shifted across the road and relocated near the Convent, was opened on 24 January 1899. St. Bride’s opened on 2 February 1899. Thus began the story of the first Catholic College in the Wairarapa. That same year the schools were examined by Government Inspectors and earned the highest commendation. The school rolls grew and extensions were made to the convent to accommodate a novitiate for the training of young women who wished train as Brigidine Sisters. By January 1905 the number of Sisters and Novices had swelled to thirteen. The much planned for new chapel was blessed and opened on Sunday 10 January 1909. By 1916 there were 20 Brigidine Sisters in New Zealand. St. Bride’s community, with help from Ireland and Australia, established two new foundations, Pahiatua 1906, Foxton 1911 and a third on the way, Carterton 1917. The next venture was the purchase of a marble Altar for St. Bride’s chapel. Mother Gertrude Banahan had earlier established a special fund for the Altar. 1928 saw a new St. Patrick’s four-classroom brick building erected on Trust Lands Trust land, near the convent, just south of the old St. Patrick’s school. It was blessed and opened on 29 January 1929. Mother Gertrude Banahan died in Pahiatua on 17 March 1932. The Golden Jubilee of St. Bride’s was commemorated on 16 December 1948. St. Bride’s had reached the halfway point in the journey to their centenary. Every Brigidine in New Zealand was present that day. High Mass, a garden party and outdoor Benediction marked the day. Growth continued, and in 1954 swimming baths greatly enhanced the College grounds, it improved the athletic skills of the girls no end. Sister Patrick Phelan a good and faithful servant and one of the pioneers, died in Johnsonville on 14 June 1952. She was a powerhouse of prayers and spent long hours in the chapel “telling the beads.” Her sense of humour is still remembered to this day. The much longed for replacement of the old St. Bride’s College finally began to take shape. Twenty-two years of patient planning were nearly at an end. The College was blessed and opened by Cardinal McKeefry on 20 September 1970. The new St. Bride’s College stood proudly on a six-acre site across the road from the old school. On 16 December 1973, St. Bride’s Convent was seventy-five years old. The celebration marked the contribution the Sisters had made to Catholic education in the community and in the Region. But the winds of change were already sweeping over St. Bride’s. That same year St. Patrick’s school was in dire need of more classrooms. It was suggested that St. Bride’s and St. Joseph’s Colleges combine on one site. It was an extremely difficult time for all people concerned. In June 1975 a decision was made to close the boarding school. A phasing out period of three years was to take place. On 9 December 1977, after the final Mass, the last boarder walked out through the convent gate. The years of planning and the erection of a new St. Bride’s College were short lived, the wide open spaces and a College under one roof were enjoyed for only seven years. 1977 was a painful year of letting go. The Brigidine Sisters acceded to the Marist Brothers conditions for amalgamation. St. Bride’s would move over to St. Joseph’s College site. St. Bride’s was sold and it became St. Patrick’s Parish school. A full circle had been turned! Nunc dimittus. Farewell St. Bride’s, farewell. The new Chanel College opened its doors in February 1978. Inevitably, the closure of the boarding school and the amalgamation of the two Catholic Colleges affected the convent situation. The large wooden structure had become a huge fire risk and the upkeep of the buildings and grounds were beyond the handful of Sisters. More farewells were ahead of the Sisters, this time the Convent itself. The decision to sell the Convent and grounds to the Post Office caused a great public outcry. The buildings were to be demolished and the land cleared. There was no alternative. 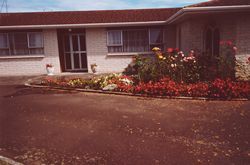 They did not want to leave Masterton, the best course of action was clear - the Community would build on property made available to the Sisters across the road. The last Reunion of St. Bride’s Old Girls at their Alma Mater, was held over Queen’s Birthday weekend 1984. The Mass, celebrated by Monsignor Moore was charged with emotion and many were the tears that flowed that day. Construction began on the site in August 1984 and the final Mass was celebrated in the chapel on 2 February 1985. A long chapter of Brigidine history was closed. The official blessing and opening of the new St. Bride’s convent took place on 17 February 1985 and the Sisters moved in early in March. The new “sapling” flourished and prepared the way for a magnificent Centenary celebration held over the weekend of 16-18 October 1998. Hundreds came from near and far to remember, to pray and to celebrate what the pioneer Sisters had begun one hundred years ago. Their faith, courage, sacrifice and fidelity still influence New Zealand society today, through the work of later generations of Sisters and pupils who have caught the spirit of St. Brigid. A special Mass in the Parish church, on 16 December 1998, with many Old Girls present, marked the official one hundred years Foundation Day celebration. Tributes were paid to the pioneer Sisters - Gertrude, Brigid, Joseph, Patrick, Teresa and Claver. To the later generations of Brigidines who, down through the years, continued the live a life of prayer and maintained the high standard of Catholic education set by the foundation Sisters. To the St. Bride’s Old Girls for their support, friendship and love in times of sadness and joy and who today, keep the spirit of Brigid alive in many parts of the world. 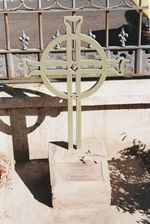 The Celtic cross, taken from the top of the old convent, stands as a memorial to the one hundred years of service given to Catholic Education by Brigidine Sisters throughout New Zealand. 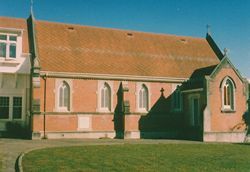 It stands opposite the entrance doors of St. Patrick’s parish church in Masterton.